GelRed is an ultra sensitive, stable and environmentally safe fluorescent nucleic acid dye designed to replace the highly toxic ethidium bromide (EB) for staining dsDNA, ssDNA or RNA in agarose gels or polyacrylamide gels. Biotium GelRed™ is an ultra sensitive, extremely stable and environmentally safe fluorescent nucleic acid dye designed to replace the highly toxic ethidium bromide (EB) for staining dsDNA, ssDNA or RNA in agarose gels or polyacrylamide gels. GelRed™ is far more sensitive than EB without requiring a destaining step (Figure 1). GelRed™ and EB have virtually the same spectra (Figure 3), so you can directly replace EB with GelRed™ without changing your existing imaging system. GelRed™ can be used to stain dsDNA, ssDNA or RNA in agarose gels via either precast or post gel staining. GelRed™ can also be used to stain dsDNA, ssDNA or RNA in polyacrylamide gels via post gel staining. GelRed™ is also compatible with downstream DNA manipulations such as restriction digest, sequencing, and cloning. Biotium offers GelRed™ 10,000X solution in water, our latest formulation that eliminates the hazards of handling DMSO for better safety. We continue to offer GelRed™ 10,000X solution in DMSO for established users of GelRed™ in DMSO who do not wish to change their laboratory protocols. The performance and stability of GelRed™ 10,000X is comparable in both the water and DMSO formulations. For your convenience, we also offer ready-to-use GelRed™ 3X in water that can be directly used for post gel staining. Compatible with downstream DNA manipulations such as restriction digest, cloning, and sequencing. Figure 1. 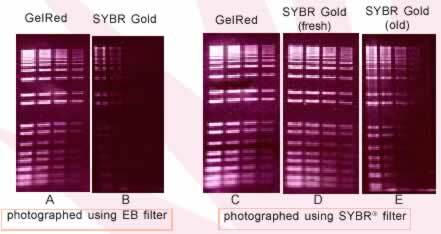 GelRed™ is significantly more sensitive than ethidium bromide (EB) for detecting low-level DNA, especially in the lower molecular weight area. 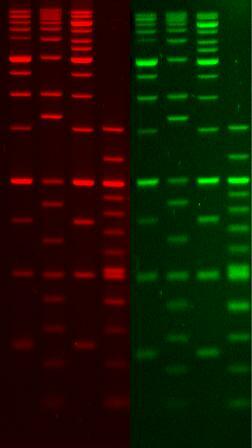 Shown left are two-fold serial dilutions of 1 Kb Plus DNA Ladder from Invitrogen electrophoresed on 1% agarose gels precasted with GelRed or EB in 1x TBE. The total amount of DNA loaded per lane was: 200 ng, 100 ng, 50 ng and 25 ng from left to right. Gels were imaged using 300-nm transillumination and photographed with an EB filter and Polaroid 667 black-and-white print films. Figure 2. GelRed™ displays consistently superior sensitivity for post gel staining, regardless of the filter used (A vs. C) and storage and handling condition. SYBR Gold, however, showed comparable performance only when used fresh from the manufacturer and with a SYBR filter (B vs. D). Following a few freeze-thaw cycles, SYBR Gold 10,000X solution degraded significantly, resulting in poor staining (E). SYBR Gold 1X solution also degrades over time (see Figure 4). Two-fold serial dilutions of 1kb Plus DNA Ladder from Invitrogen were electrophoresed on 1% agarose gels in 1x TBE and post- stained with GelRed™and SYBR Gold, respectively. Gels were imaged using 300-nm transillumination and photographed with the indicated filters and Polaroid black-and-white print films. The total amount of DNA per lane for each serial dilution was: 200 ng, 100 ng, 50 ng and 25 ng from left to right. Please also see Biotium’s EvaGreen™ a breakthrough nucleic acid dye ideally suited for quantitative real-time PCR (qPCR). By incorporating a smart “release-on-demand” DNA-binding technology, EvaGreen™ has low PCR inhibition while exhibiting superior sensitivity. Similar to Biotium’s GelRed™, EvaGreen™ has remarkable stability.